In a one-day program, learn the top success principles including: (1) Take 100 percent responsibility for everything in your life; (2) Be clear why you’re here; (3) Decide what you want; (4) Believe it’s possible; (5) Believe in yourself; (6) The power of visualization and goal setting. (7) Taking Action. (8) Overcome the fear (9) Seek and value Feedback. (10) Reject rejection. All of the success principles teach how to increase your confidence, tackle challenges, live with passion and purpose, and realize your highest ambitions. The success principles have helped thousands of students around the world realize their dreams of achieving breakthrough success in their respective careers, greater wealth and flexibility in their finances, genuine joy in their relationships, and greater happiness and fulfillment in their lives. Created by Jack Canfield, one of the world’s leading success coaches and authorities on peak performance. Canfield has authored or co-authored 110 books with over 500 million copies in print worldwide in 46 different languages. Michael Kline will lead you and your team through The Success Principles to get your organization from where you are, to where you want to be. Currently serving on Jack Canfield’s Breakthrough to Success Assisting team, Michael continues to stay immersed in the lessons and accompanying personal growth work by helping Jack’s students get the most out of their learning experience. 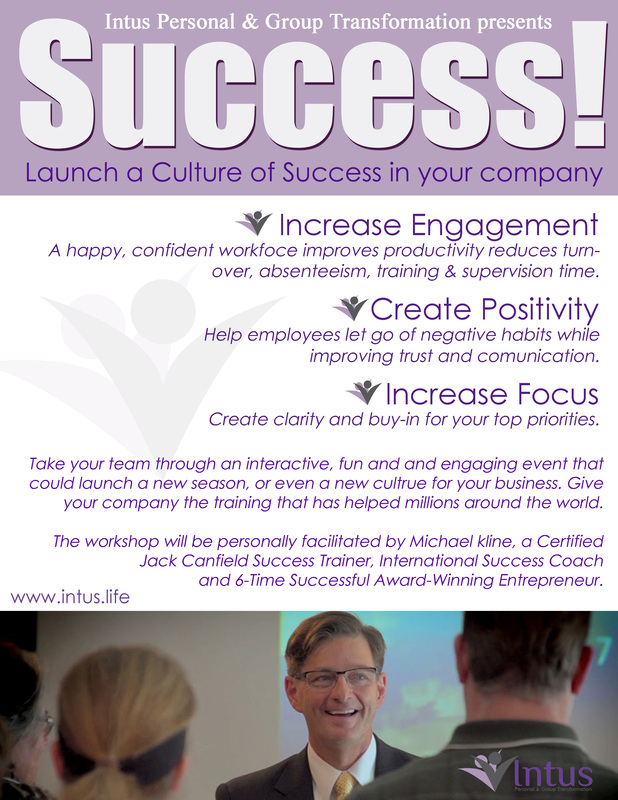 Michael is available throughout North America for 1/2 day - multi-day programs based on The Success Principles. Who better to help you get form where you are to where you want to be? Mike began life as the 13th of 14 children born into poverty on a junkyard, with an alcoholic father and no indoor bathroom. With much gratitude, Mike knows that time has polished the lessons from the junkyard into the secrets to living a dream life. He can help you move forward too. After studying transformational training personally under Jack Canfield, America’s #1 Success Coach, Mike landed a position on the Canfield assisting team. Jack created an intensive train the trainer program to create protégés to carry this work out into the world as his legacy. Michael Kline was among the very first to become a Certified Canfield Trainer. ​Mike has delivered over 400 seminars, helped countless entrepreneurs create new lives and successfully launched 6 businesses himself. No one is more prepared to combine their personal experience, expertise and training to help you and your organization move forward from wherever you are to wherever you want to be! What’s this expertise all about? It doesn't matter if your goals are to be the top sales person, a super-star athlete, lose weight, become a better parent, better nurse, administrator, teacher, or leader, increase confidence, buy your dream home or make millions of dollars – These principles can help you develop a clear, personal plan of action that will completely transform your life into exactly what you want it to be. Mike has created a special fast-track one-day success-a-thon… To get started, try our one-day workshop full of life-changing tools your people can use right away. Learn easy ways to accelerate your success. This powerful day will give you a starting point to launch a new era for any group! With Mike’s personal guidance, your team will discover a greater sense of purpose, prioritize their goals and discover the proven steps to achieving anything they want. We will also remove limitations from the past, allowing individuals to attain un-imagined levels of success and make positive and lasting changes. Participants will walk out the door with more clarity about where they're going – and more confident they will get there. This amazing day covers every aspect of personal and professional fulfillment in life.